*Modified devices or operating systems not supported. **Mobile Payment Acceptance card reader must be ordered through TSYS. ***Check Ingenico Device Compatibility for a list of phones and tablets that are confirmed to work with these readers. Refer to the RP450c list for the RP457c. What is Mobile Payment Acceptance? 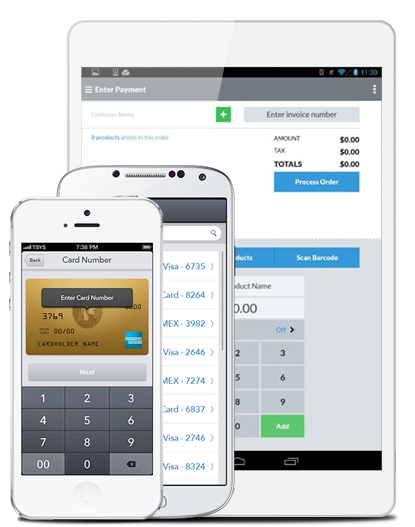 Mobile Payment Acceptance is a downloadable application that enables you to accept and process credit and debit card payments anywhere your business takes you. How does Mobile Payment Acceptance work? The payment application is downloaded to your wireless device from the Apple App StoreSM and Google PlayTM store. Currently this app works for both iOS and Android devices, and is optimized for Android tablets with additional customer, product and dashboard functionalities. Once the application is installed, you can accept credit card payments either by entering information manually or by using a configured card reader. The application also allows for cash payment. The data is then securely transmitted over the Internet to your payment processor. Who can I contact if I have problems with Mobile Payment Acceptance? Application support is available 24/7 for all Mobile Payment Acceptance customers. Mobile devices, card readers and printers are supported by the device manufacturer. How secure is processing payments on my mobile device? The process is very secure. Information is fully encrypted from the card reader to the processor's secure network where the information is safely stored. Information is not stored on the device. Mobile Payment Acceptance uses an HTTPS connection over SSL (Secure Sockets Layer) at 128-bit encryption. Signature debit is accepted; however, PIN-debit is not supported. What transaction types are supported by Mobile Payment Acceptance? 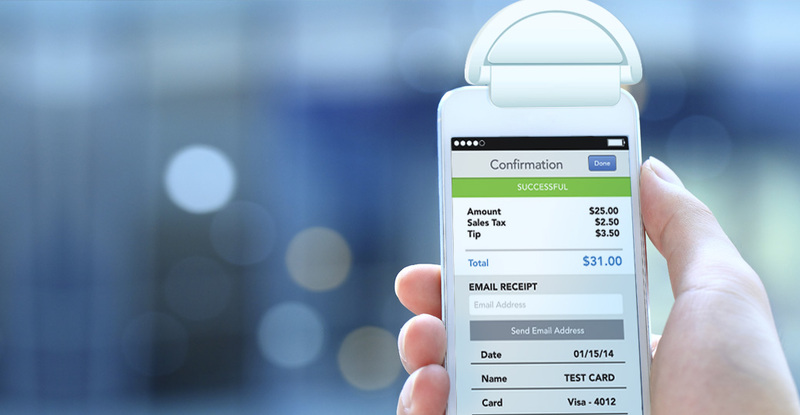 In addition to payments, Mobile Payment Acceptance supports voids, canceled orders and returns. A typical transaction will take a few seconds to complete but varies depending on location and strength of wireless signal. What happens if the service goes down during a transaction? If the auto process offline feature is turned on, then the transaction will automatically process when the Internet connection is restored. If the auto process offline feature is not activated, then the transaction request is canceled, an error message is generated and a new transaction will need to be processed. Is a customer signature required for payment? While a signature is not required, users can easily capture their customer's signature directly on their device’s touch screen and email a receipt. You and your customers will be safe and secure. A unique user name and password are required to access the application and no credit card information is ever stored on your device. Your customers' payment information is safely stored on a secure server. In addition to deactivating the device itself, the Mobile Payment Acceptance login can also be deactivated. Are Mobile Payment Acceptance charges billed onto my wireless provider’s plan? No, Mobile Payment Acceptance charges will be billed to you on a separate invoice. Your wireless provider will bill you for their services as they normally do under your agreement. Where can I see all my Mobile Payment Acceptance transactions? You can access full transaction reporting through Merchant Center, an online reporting hub. You can also access up to 13 months of transactions directly on your mobile device. Adobe® Flash® Player version 8.5.0 or higher is required to access Merchant Center. What if I have multiple employees who need to use Mobile Payment Acceptance? There is no limit to the number of employees who can be granted permission to process transactions with Mobile Payment Acceptance. Each employee will be assigned a unique ID and password to access the application. If your business requires more than one shift, your employees can share a device, as long as they use their own ID and password. Can I use my own mobile device and service plan? Yes, if you have one of the Mobile Payment Acceptance-supported devices. To view a list, please see the Compatible Devices section. Mobile Payment Acceptance works with WiFi, so a data plan is not required. Visit our Compatible Devices section for the list. Is there additional hardware to purchase with Mobile Payment Acceptance? No additional equipment is required. An optional card reader will provide the opportunity to qualify for the best interchange rate. Note: The Mobile Payment Acceptance card reader must be purchased through TSYS. Audio jack card readers should be used on devices without cases to ensure proper connection. Audio jack extenders are not supported per the manufacturers. For optimum performance, users are advised to use the card readers listed in the Compatible Accessories section. ©2014-2018 Total System Services, Inc.® All rights reserved worldwide.